Miles Vorkosigan and his cousin Ivan are sent on a diplomatic mission to the court of the Cetagandan Empire, Barrayar's former enemy. This sophisticated, genetically advanced but in many ways alien society both fascinates and repels, and when the Cetagandan Empress and her attendant die suddenly, Miles and Ivan find themselves embroiled in intrigues that are hard to fathom. Ivan's romances and Miles' infatuation with a noble Cetagandan lady further complicate matters. Cetaganda is one of those "filling in the blanks" books. It comes after The Vor Game in chronological order, but it was actually written after two or three more books were out. As far as I can tell, that means that the whole issue of Miles as Admiral Naismith and the Dendarii Free Mercenaries is left to one side (I'm assuming something will happen in that area in the next few books), and we get a little side-adventure. 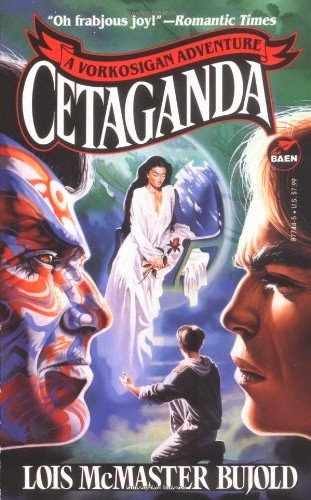 That side-adventure takes place in Cetaganda, of all places. Miles and his cousin Ivan Vorpatril are on an official mission, representing Barrayar at a state funeral. Trouble starts even before they properly land. The Barrayaran ship is directed to a docking bay which is strangely deserted. A strange man in a technician's overall comes on-board, a scuffle ensues and he runs off, leaving Miles and Ivan in possession of a mysterious object the man had in his pocket. By the time they get redirected to the right docking bay (containing the expected full complement of Cetagandan officials to provide a proper ceremonial reception), they have decided to keep quiet about it. They'll just tell the Imperial Security man as soon as they get to the embassy. Turns out the ImpSec man is away on a short trip, and that's enough to get Miles investigating on his own. Because clearly, something very strange is going on. Before long, Miles and Ivan (pressured by Miles, of course) are fully involved in what could become a truly damaging mess, both for Cetaganda and for Barrayar. I found the plot entertainingly convoluted. Miles is Miles, though, so his brainpower and gift for strategic thinking allow him to make some quite impressive deductions. But really, it's all about the world-building here, and that succeeds only in parts. On the positive side, Cetaganda is quite a fun place to read about, with its noble ladies floating about in opaque white bubbles and its aristocratic classes obsessed with aesthetics and genetic manipulation. It all creates some fantastic visual pictures. Most of all, I liked that Bujold is trying to explore some quite interesting concepts with this world, such as where does power really come from. It's a world, however, that doesn't really bear too much examination. When Bujold describes and contrasts Barrayar and Beta Colony, I get it. Given their history, the way they work makes sense. With Cetaganda, I never completely bought the way their culture is supposed to have evolved. I don't know if it's an intrinsically flawed concept or just that we don't get enough depth here, but I just wasn't convinced. That isn't a fatal flaw, though, and on the whole, I enjoyed this very much. MY GRADE: A strong B.
I've been enjoying your reviews of the Vorkosigan books, and tend to agree with most of your comments on them. This is one of the books in the series that I liked when I first read, but which I almost never reread, unlike Memory, or even The Mountains of Mourning. I'm looking forward to more reviews on Miles and his adventures! Does this book explain why the Cetagandans are so despised by the Barrayarans? I'm thinking of things that happen in later books that make the issue seem more than just enemies. I always think of this as the Ivan-and-the-kittens book. On the bright side, my personal take on the series is that once you're past this (and 'Ethan', but I don't count it) it's all good until Diplomatic Immunity. Aoife: Thanks! It does feel a bit more insubstantial than the rest. Enjoyable, but no more than that. Darlynne: So far all I've seen is about Cetaganda having invaded Barrayar at the time of Miles' grandfather. They're also the other big guys in the neighbourhood, so always looking to gain an advantage. I haven't really seen anything to indicate they are particularly despised, other than the Barrayarans finding their culture very weird! That the thing, all the weird bits of their culture seem like such an obviously bad idea. But there must have done really well a couple of generations back, I suppose. I have already read Ethan, I'm glad to say (the not-very-positive review will be posted in the next couple of days, and I'll be all caught up on my Bujold reviews). Can't wait to read the next!